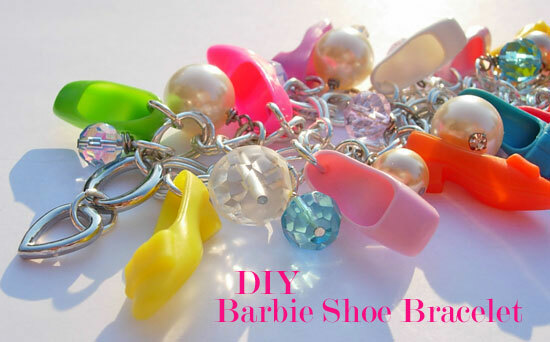 Use Odd Charms and Barbie Doll Shoes for Jewelry! We all have leftover beads and charms. Not enough to make something out of but definitely still worth keeping and using. So head on over to these two fabulous tutorials which show how odd charms can be made to go altogether. 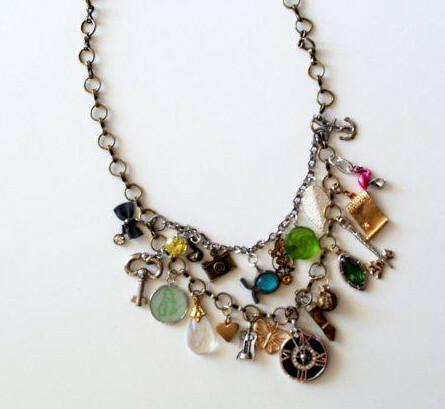 First up is the charm collage necklace tutorial by Beverly of Flamingo Toes. She was inspired by a charm based Anthropologie necklace. Quite honestly, I like her version better! If there are charms leftover, then make a bracelet. Many small things have the potential to be little charms after little holes are made in them. Like Barbie doll shoes and handbags. Check out the DIY Barbie doll shoe charm bracelet by Diane over at the In My Own Style blog. She created it as a birthday gift for her twin sister Carol who collects vintage Barbie doll clothes. Makes me want to hit the yard sales for doll shoes! If you love the Barbie doll idea, be sure to check out this past feature designer who makes fabulous jewelry from Barbie doll parts. Clever use for hodge podge charms and odd bits of interesting paraphernalia. Sometimes two or three items make a piece that is only "meh!" whereas a whole bunch of them really work well together.